Today, I’m going to interview Dr. David Cotten (dcotte1@uga.edu), an Assistant Research Scientist in the Center for Geospatial Research in UGA’s Geography Department. He is also the Lab Supervisor at the Small Satellite Research Lab (SSRL, https://www.smallsat.uga.edu/) at the University of Georgia and we will discuss their CubeSat projects. Q: What is a ‘CubeSat’? A: A CubeSat is a type of mini-satellite for space research. It is integrated by multiple cubic (10cm*10cm*10cm) units. Usually, it weighs less than 1.33 kg per unit, and is commonly deployed from the International Space Station. Many groups are using these small and relatively cheap satellites to develop new and cutting edge technologies. Q: How was the Small Satellite Research Lab (SSRL) founded? 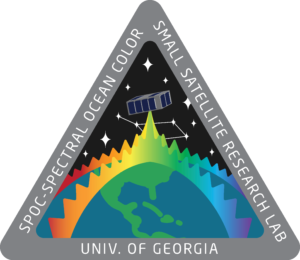 A: The SSRL was founded because the University of Georgia was recently been awarded two grants for undergraduates to lead the designing, building, testing, and launching of satellites, CubeSats, into space. If successful, these will be the first UGA made satellites in orbit around the Earth. We envision the SSRL as the cornerstone in the foundation of a future UGA Aerospace Program founded through interdisciplinary collaboration and aggressive grant writing, as well as a pipeline to bring high quality, motivated students to UGA and to train them for STEM careers. This collaboration came about from a group of independent students who wanted to build their own 1U CubeSat as well as a group of faculty that wanted to design their own satellite sensor. In the summer of 2015 these two groups met, joined forces, and applied for two university based CubeSat grants. By earlier 2016 the two projects were funded and the multidisciplinary lab was founded. Q: Who are those faculty advisors of the SSRL? A: Currently the lab encompasses undergraduate students and faculty from all over campus: geography, physics, engineering, mathematics, computer science, marine science, design, and management. Both projects one funded by the Air Force Research Laboratory’s (AFRL) University Nanosatellite Program (UNP) and the other funded by NASA’s Undergraduate Student Instrument Project (USIP) are supervised by 14 faculty members, lead by PI Deepak Mishra and Co-PI David Cotten, across 5 departments within UGA. In response to the funding of these projects SSRL was created to ensure UGA’s involvement in training undergraduates for a STEM related workforce. Q: Are there any specific goals that the SSRL want to achieve? A: There are two specific missions. Along with the two missions, the lab has the primary goals of teaching and developing students for STEM careers by training undergraduates in a broad range of fields through hands on, experiential learning and creating a pipeline for high school students to attend UGA. Last year undergraduates, with the help of faculty around campus, founded a Small Satellite Research Laboratory. The lab is an undergraduate led research lab, mentored by faculty, with the goals of launching small, inexpensive satellites into space for gathering scientific data and providing experiential learning opportunities for University of Georgia students. Currently 54 undergraduates from all over campus (geography, physics, engineering, mathematics, computer science, marine science, design, and management) lead and operate the lab. The students strive to enhance science education within and around the UGA community through their scientific endeavors. They are hosting a Women-in-Technology workshop, served as guest lectures at local high schools, mentored high school interns, and participated in the NSF-LISELL-B family workshops. The lab currently has two missions, namely SPOC and MOCI. The SPectral Ocean Color (SPOC) satellite mission, is funded through NASA’s second iteration of the Undergraduate Student Instrument Project (USIP). SPOC' mission is to acquire moderate resolution imagery across a wide range of spectral bands to monitor coastal ecosystems and ocean color. It will acquire image data between 400 and 850 nm to monitor 1) coastal wetlands status, 2) estuarine water quality including wetland biophysical characteristics and phytoplankton dynamics, and 3) near-coastal ocean productivity. SPOC shall use hyperspectral remote sensing techniques to quantify vegetation health, primary productivity, ocean productivity, suspended sediments, and organic matter in coastal regions. SPOC was also chosen for NASA’s eight class of candidates through the CubeSat Launch Initiative. Through this initiative SPOC will be launched either 2018, 2019, or 2020. The second mission, The Mapping and Ocean Color Imager (MOCI) is funded by the Air Force Research Laboratory’s (AFRL) ninth iteration of the University Nanosatellite Program (UNP). The MOCI mission will acquire imagery of the Earth’s surface from LEO and perform real time Structure from Motion (SfM) at a landscape scale. The MOCI mission will also identify and map coastal phenomena such as sediment plumes and algal blooms while training students in STEM related fields. Efficient data compression, transmission, and SfM processing techniques of space based imagery will be performed on board the spacecraft. The secondary goals of the project will be to lay the foundations for a self-sustaining Small Satellite Research Laboratory (SSRL) at UGA, and by creating a free repository of imagery and an on-demand imagery request service. In addition, SSRL will engage with the public through the development of outreach programs such as workshops, instructional YouTube videos, educational podcasts, and performing guest lectures at local schools and events. For more information about the SSRL, including teams, presentations, news, etc., please go to the official website of the SSRL (https://www.smallsat.uga.edu/).